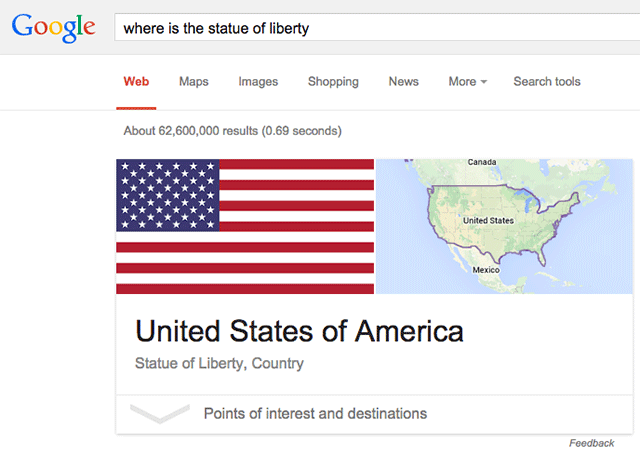 Go ahead, as Google's all so mighty Knowledge Graph where exactly is The Statue of Liberty. You'd likely search for [where is the statue of liberty] and the answer you'd get is, "United States of America." It is not incorrect but the United States of America is a pretty big place. At least Bing gives you the zip code it is located in. One more funny example of the knowledge graph at Google not being perfect, trust me, there are plenty of examples but there are also more examples of it being wildly exact in its answer that it is scary. This was spotted by @NortheasternExt.